NEWPORT – Around this time each year, many baby seal pups find their way to Oregon’s beaches … and each year, well-meaning people put the young animals in danger by trying to “rescue” them. The word from the experts: Keep your distance, keep your dogs on leash – and whatever you do, don’t touch. The pups are simply waiting for their mothers to return from hunting for food. Rice urges beach goers to stay at least 50 yards from any pup they spot on the beach – and to make sure children and dogs do, too. Approaching the young animals can cause life-threatening stress, and will almost certainly keep their mothers from rejoining them. Harbor seals on the Oregon coast give birth from March through June, with a peak in mid-May, and authorities have grown accustomed to reports of “stranded” baby seals as more summer visitors come to the coast. Such reports are unnecessary unless an animal appears to be injured or in distress – or if you spot someone bothering or harassing the animals. In such cases, Rice urges a call to the Oregon State Police at 1-800-452-7888, Rice said. Under the Marine Mammal Protection Act, people harrassing these animals – even out of a misplaced desire to help – risk being fined. 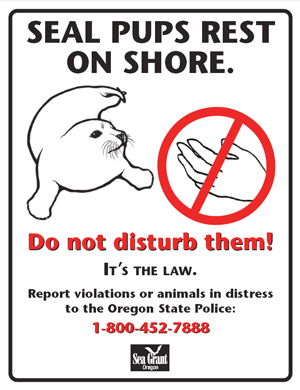 The federal Marine Mammal Protection Act prohibits interference with seal pups and other marine mammals on the beach.